So I discovered this weekend that Aiden's top teeth are cutting!!!! How exciting is th at!!! His bottom two teeth came in around valentine's Day when he was only 5 months old. While I was at Wal-Mart one day with one of my fellow Mommy's Tasha and saw some puffs by Gerber that dissolve in the mouth. I decided that it was about time Aiden started feeding himself something and learn how to chew. And boy is he cute when he chews. The puffs came in a variety of flavors but I decided on Apple Cinnamon and sweet Potato. Unfortunately they were not organic, but I figured that he would not be eating them ALL the time and I was sure that I would find some that were organic. He LOVED them...and what I think he loved the most was the fact that he co uld feed them to himself!!! He got super excited when I put him in his high chair and poured a few on the tray. While we were in Minnesota last month I went to the market close to Talia's (my oldest friend whose son Garyson is about 6 months older than Aiden) house and they had ORGANIC puffs!!! Of course I got some to see if Aiden would take them and he did!!! I was so excited!!!! 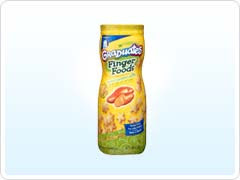 And they are made by Happy Baby...the company I spoke of before that has organic baby food that comes frozen. The Happy Baby flavors are Apple, Banana, and Greens. So Aiden was all out of the apple so while at Babies R Us today I decided to get all three flavors. Aiden is NOT a fan of banana but for $2.99 I figured it was worth a shot. So look for an update on if he likes banana and greens. I hope that he does. Oh, while I am on the subject of BRU (Babies R Us), I went there today to pick up a few of my favorite things. I had to get Aiden some more of the Safety Spoons that I like by Munchkin. They turn white if the food is too hot...and the spoon is soft so it feels good on his gums. I also had to get a Snack Trap to put his puffs in when we travel. I needed to get some more of my favorite bottle brushes that are BRU brand, but they were sold out....guess they are other Mommy's favorite as well!!! !